Spinning-wing decoys continue to make a significant difference. Late mallards. I've fooled them. Not just a single that happened to wander past in the first shooting light, but flocks of 30, 40 birds on clear January mornings. And not just dropping down to take a look but hooked up over the spread, the lead birds reaching for the water, the whole bunch talking to the decoys. I can describe every time it's happened right down to the direction of the wind and the slant of the light, just as I can describe the morning I was married, and for the same reason -- there are some things in this life that just don't happen very often. Those perfect flocks stand out against a thousand days of frustration, days when there was enough of a breeze to make the decoys swim, when the calling was perfect and my hide was invisible. And the birds are always there, materializing out of a perfect blue sky a hundred yards above the water, thirsty from a morning on the stubble, ready to drink and rest. There is never anything for them to see, but that makes no difference. Somehow, they feel my presence and just refuse to come that last 70 yards. Opinions vary on this matter, but I've come to believe that those days are worse than the days with no ducks at all. When the ducks simply don't show up, I can always call the exercise a draw, but when a flock or two comes down to look and see through the deception, I've been beaten. 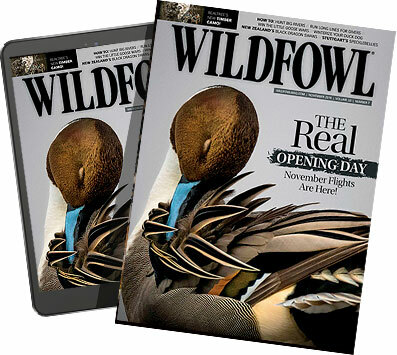 Like every other waterfowler I know, I've spent countless dollars and hours trying to improve the odds, and there are entrepreneurs out there who are doing their best to help with the problem. Some of their ideas strike me as fairly silly -- fake corn on the cob, for example -- but every now and then, they come up with an idea that really works. Take the spinning-wing decoy. Spinners definitely are effective, especially in field hunting situations. The idea came out of California in the late 1990s -- a duck body on a pole with wings spun by a battery-powered motor. It was one more way to add motion to a spread, an approach that began centuries ago with tolling dogs and, through the generations, proceeded to jerk lines, flags and kites. Early rumors about the spinners were enthusiastic. As one Dakota waterfowler said, "You pushed that button and it was like it was raining ducks." In the years that have followed the introduction of these decoys, some hunters have said that ducks have learned to avoid them just as they have learned to be wary of many other waterfowling techniques. However, research on spinning-wing decoys suggests that they continue to make a significant difference. The most recent study comes from father-and-son waterfowl biologists, Dale and Jason Caswell. The Caswells tested the efficiency of spinning-wing decoys in southern Manitoba, setting up 152 hunts over two years. The hunters in the study used two-dozen magnum mallard decoys and one spinner. They turned the spinner on for 15 minutes, then off for the same period. The Caswells kept track of the number of birds killed and crippled and also used range finders to measure how close each flock came to the spread. Continued -- click on page link below. The results? In the marsh, ducks were 1.9 times more likely to fly within 40 yards with the spinner running than when it was off. Hunters killed five times more ducks when the wing-spinner was active. Interestingly, crippling dropped from about 0.3 birds per hunter to about 0.2 birds per hunter when the spinner was on. The difference was even greater in field hunts: Ducks were five times more likely to fly within 40 yards when the spinner was running, and kill was 33 times higher. During the early season, crippling rates didn't change, but late in the season, crippling was 3.7 times lower when the decoy was running. The Caswells also sexed, aged and weighed the birds that were killed during the experiment. Other research has suggested that juvenile ducks are more likely to come to decoys than their parents. There is also reason to believe that ducks in poorer condition are more likely to come to decoys than ducks that are well fed. The Caswells found that the spinning-wing decoy changed that pattern -- when it was running, hunters generally killed more adult mallards, and the birds they took were heavier, i.e., better fed. Of course, Manitoba waterfowlers have the luxury of hunting untutored mallards. If the ducks are learning to avoid spinning-wing decoys, their increasing wariness is likely to be most obvious farther south, but studies down the flyways have seen the same impact. Researcher Michael Szymanski set up a study in Minnesota similar to the Caswell's -- 367 hunts with two spinners turned on and off at 15-minute intervals. Mallards were 2.9 times more likely to fly within 40 yards when the decoys were running. Flocks responding to the spread were 1.25 times larger when the spinners were on, and hunters killed 4.7 times more mallards. The kill per hour didn't change much as the season went on, either -- the spinners seemed to be as effective in the late season as they were earlier. In his report, Szymanski pointed out that less than six percent of the hunters in the study killed a limit of ducks, even with the help of spinners. Crippling rates in his study did not go down when the spinners were being used. Another study in Minnesota has found that hunters using spinners killed an average of 16.3 ducks per season, while hunters without spinners averaged less than one bird a season. (It's likely that the hunters using spinning-wings spent more time in the field as well.) Data from Missouri shows that waterfowlers using spinners killed 1.6 birds per day, while hunters without a spinner killed less than one per day. Illinois has collected similar numbers: Hunters using spinners averaged 1.8 ducks a day while hunters without averaged 1.1 a day. Work in Nebraska has shown that average duck harvest in marshes can be twice as high with spin-wing decoys as it is without. In the late season, mallard harvests may be three to four times higher with spinners. A study in California found that duck hunters using spinners killed six times as many birds in the early season, four times as many birds in the middle of the season and twice as many birds in the late season as hunters without spinners. A check-station survey found that hunters using motorized decoys killed 56 percent more birds than hunters who didn't use them. Crippling rates there did not go down when spinners were being used. o far, there is no evidence that spinners are reducing duck numbers on a wide scale." The effectiveness of the spinning-wing decoy has waterfowl biologists wondering about several management issues. First, is this new technology reducing duck numbers on any flyways? We have a better picture of North American duck populations and their trends than we do for any other group of widely distributed wildlife. Still, the forces that affect duck numbers are complicated and difficult to track. It's nearly impossible to figure out how a change in hunting technology affects duck numbers continent wide. So far, there is no evidence that spinners are reducing duck numbers on a wide scale. Second, is this technology a special threat to particular species or local populations of ducks? For California biologists, the high rate of mallard harvest over spinners early in the season was a danger signal. They were afraid that local mallard populations might suffer unless early-season use of spinners was restricted. This may be an important consideration in any area that combines heavy hunting pressure with important local birds. So far, there is no research on the effect spinning-wing decoys might have on species like black duck and pintail. Third, is this technology changing the distribution of duck harvests? Harvest statistics haven't shown a sudden spike since the advent of spinning-wing decoys, so they may have no effect on overall harvest. Several studies show that spinners are effective on adult ducks and continue to be effective down the flyway, suggesting that they aren't likely to give northern hunters a new advantage. However, it's clear that hunters with spinners take more ducks than hunters without. Four states -- Pennsylvania, Oregon, Washington and Arkansas -- have already banned motorized decoys, or some form of decoy that spins or flaps their wings or vibrate in the water. California and Minnesota have banned motorized decoys in the early part of the season, and the U.S. Fish and Wildlife Service has been encouraging discussion, trying to decide whether federal regulation might be in order. Over the last century, ethics have repeatedly made their way into the laws that govern waterfowling. If maintaining populations of ducks is our only concern, we can do it with little more than a well-enforced bag limit and a season of the right length. The laws against live decoys, baiting, sink boxes, punt guns, shooting after dark, hunting from boats under power or sail, loading more than three shells and using recorded calls have more to do with ethics than managing waterfowl. At some point, we decided that certain ways of killing birds wandered over the line separating sport from slaughter. The man who taught me how to hunt said that an ethical hunter never takes advantage of his quarry -- he gives advantage. When our best effort never succeeds, we probably have room to look for more efficient techniques. When we never fail, we should consider ways to limit ourselves. That's the balance that makes fair chase fair.